The third time through the batting order did the trick for the Clackamas Cavaliers Wednesday. Kylie Hegar and Kylee Vanderbout hit back-to-back home runs in the fifth inning -- Hegar a two-run blast, Vanderbout a solo shot -- lifting the Cavaliers to a 3-2 come-from-behind win over Roseburg in the second round of the OSAA Class 6A softball playoffs. Clackamas starter Nicole McBride scattered five hits with two walks and one strikeout to help send the No. 2-ranked Cavaliers (24-5) into Friday's quarterfinals at home against No. 7 Grants Pass (23-5). "We've never been past the second round before, so this is big for us," said Vanderbout, the Cavs' senior second baseman. "I'm excited. I think this is our year. We're graduating eight seniors and seven of them start, so this is it." Roseburg scored a run in the second inning and another in the third to take a 2-0 lead, but the Cavaliers turned the game around in the fifth when turned three hits into three runs. Indians' starter Madysn Belvins took a two-hit shutout into the fifth when Kaylee Lawrence singled back up the middle to lead off the inning. 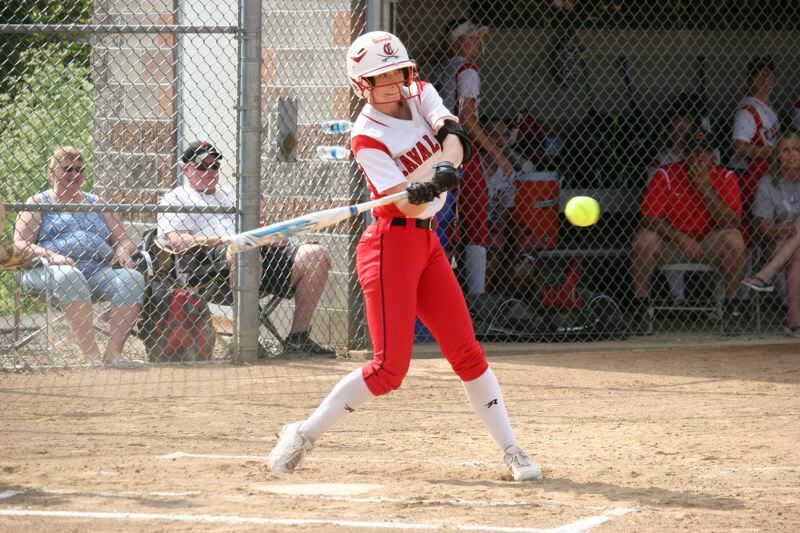 Lawrence advanced to second on Madison Stateler's sacrifice bunt, and then held at second when Shaylee Monise hit a fly to center for the second out. Next came Hegar, the freshman catcher and leadoff batter, who had flown out to left and struck out in her first two at-bats. "I knew that the pitcher was throwing a lot of change-ups and that all I had to do was sit on one," Hegar said. "I got two strikes right off the bat, so I had to battle through. Then I got a change-up and had it timed and it just went out to left field." Hegar's second home run of the season tied the game and set the stage for Vanderbout, who had struck out and popped out to third in her first two at-bats. "I was just super-pumped up," Vanderbout said. "I was looking first-pitch fastball, because when Kylie hit the change-up out, I knew there would be a fastball coming." Vanderbout got the pitch she was looking for, but fouled it off. Then she looked at three pitches out of the strike zone before turning on a 3-1 fastball that she drove over the fence in left field to give Clackamas the lead. "It was a big inning for us," Vanderbout said of her homer. "We started off a little slow, but we picked it up toward the end and came through." So, what was different in the fifth inning that wasn't happening earlier in the game? "We started to get a bead of Roseburg's pitcher," Cavaliers coach Ken Gemma said. "We started to figure out what she was doing, what she was throwing, and what kind of rhythm she was in, and once we got that, we started hitting the ball. "It's hard to keep this team from hitting. We hit for power, which everyone has seen throughout the year, and once we start hitting, the home runs just happen. There haven't been too many games where we haven't put at least a couple out of the park." Roseburg's Samie Bergmann led off the sixth by getting hit by a pitch and was at third base with two outs when McBride got Alexa Ligon on an inning-ending grounder to second. In the seventh, McBride retired the Indians in order, getting a strikeout, and a groundout to second, and a flyout to right. McBride didn't allow a hit after the third inning and faced only one batter over the minimum through the final 4 2/3 innings. "Nicky was solid all the way through the game," Gemma said. "There were times where we weren't getting the strikes on the corners, but that how it is sometimes. Whatever the umpire says, goes. We just keep throwing 'em, hoping not to walk people, and I think she had only two walks, so that's a heckuva game." Blevins pitched six innings, allowing three runs on seven hits with one walk and four strikeouts for the Indians (17-10).